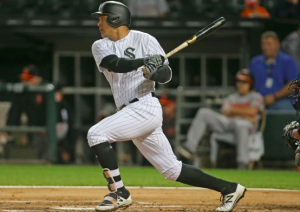 Chicago White Sox outfielder Avisail Garcia will end what has been a disappointing April on the DL. The White Sox placed Garcia on the 10-day DL Tuesday with a strained hamstring. The move comes one day after Garcia was removed in the 2nd inning of Chicago’s win over the Mariners. The club has called up outfielder Daniel Palka to take Garcia’s spot on the roster. Heading into the season, the 26-year old Garcia was slated to be one of Chicago’s most important offensive players. He enjoyed a true breakout season in 2017, hitting .330 with an OPS of .885. Over the course of the season, Garcia contributed 18 home runs, 27 doubles, and 80 RBIs, all career-highs in his sixth big league season. However, that dream season has quickly turned into a nightmare for Garcia early in the 2018 campaign. Tasked with being his team’s no. 2 hitter, Garcia is hitting just .233 with one home run and four RBIs. He currently has an OPS of .565. Despite those struggles early in the year, Garcia remains an important part of Chicago’s lineup. On Tuesday, White Sox manager Rick Renteria described the injury as “mild to moderate.” The manager adds that Garcia will be re-assessed in a few days. Based on that, a short-term absence appears to be more likely for Garcia. However, he was in obvious pain Monday night after pulling up lame while running full speed to first base. How the White Sox will handle Garcia’s absence remains to be seen. None of Chicago’s other outfielders have been particularly productive this season. Avisail’s namesake Leury Garcia may get the first crack. Early in the year, Leury is hitting just .200. However, in 300 at-bats last season, he hit .270 with an OPS of .739, so the White Sox could see an uptick in his production if he starts getting regular playing time. Trayce Thompson could also be an interesting player to watch. After bouncing around on waivers for most of April, Thompson may have a chance to stick with the White Sox. He’s just a .232 career hitter, but he does possess plenty of power. As a part-time player with the Dodgers in 2016, he contributed 13 home runs and an OPS of .738. He’s another player who could contribute if given a chance. Finally, there’s the 26-year old Palka, who’s poised to make his big league debut. Despite being a former 3rd round draft pick, Palka is a rather unheralded prospect in the White Sox loaded farm system after being claimed off waivers from the Twins last November. The left-hand hitting Palka was hitting .286 with an OPS of .860 at triple-A before his promotion. He’s also just two years removed from hitting 34 home runs in the minors in 2016. With just five wins on the season, an injury to Avisail Garcia, even mid-slump, is not what the White Sox need right now. Nevertheless, his injury does open the door for other players to see more time, which can be important for a rebuilding team. However, the White Sox will no doubt be hoping that Garcia can return from the DL as soon as possible.